The 14th edition of the Wizz Air Skopje Marathon officially ended and it was filled with a great atmosphere thanks to the organizers, supporters and participants. Thousands of competitors finished the race at 5km and the half marathon in full shine, but the grandiosity of the Wizz Air Skopje marathon was taken by the marathoners themselves. The first place was awarded to Evans Bevot, whose time was 02.14.08 and Jadeida Karungu finished with 02.51.24. Second place in the male category was taken by John Langat with 02.14.59 and by female Marija Vrajic on 03.02.00. 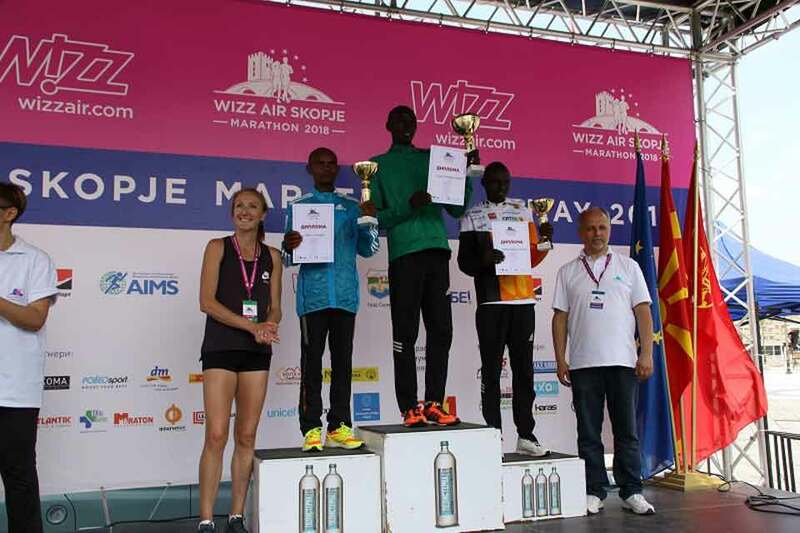 The third place was won by Josea Kiprotich with 02.28.58 from the male and Andrijana Pop Arsova on 03.05.04 of the female category. By this time, Andriana Pop Arsova broke the state record in a marathon for women. The marathon is the hardest type of athletic race in the world, and therefore every maintenance is a serious step forward in the development and maintenance of the discipline. This is being upgraded with Wizz Air Skopje Marathon, which has been part of some of the best marathons in the world for years. This manifestation is the biggest sporting event in Macedonia and beyond, and every year the record number of reported is being demolished. We believe that sports regularly develop and that it is time for more people from Macedonia to start preparing to apply for the semi-marathon and marathon competition next year, "said Kire Sinadinovski, director of Wizz Air Skopje Marathon. He added that for years they follow the experiences of the world's metropolises and that for this reason the Wizz Air Marathon will continue with the constant undertaking of innovative steps in order to increase its development. In the category of Macedonian competitors of the marathon from the male first three were Aleksandar Kiradziev with 02.42.48, Marjan Bonev with 02.48.33 and Kokan Ajanovski with time from 02.54.41, and from women Andrijana Pop Arsova with 03.05.04, Biljana Kiradzhieva with 03.15 .55 and Vesna Kiradzhieva with 03.32.16. These excellent athletes from Macedonia have been competing for years and represent an unmistakable incentive for anyone who wants to venture into this discipline. The 14th edition of the marathon is under the auspices of the City of Skopje, the Delegation of the European Union and the Agency for Youth and Sports of the Republic of Macedonia. Skopje Marathon is traditionally held on the occasion of Europe Day.